Bridle fits in any case, nose belt for very large head, baking pieces good size, throat belt fits just and reins are size mini for my big horse (size xl ordered) now find other reins and then I can let horse dear still stretch neck. quality leather is good in relation to the price. Beautiful English bridle that I use at the hunter competitions. 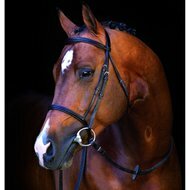 Bridle feels smooth and is easily adjustable. Very nice bridle. Is well, the size is right and my horse's fine, small head does not disappear in this bridle. Quality is very good and lasts a long time, requires little maintenance. Super bridle! 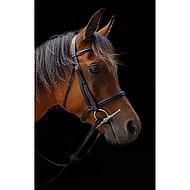 I have an arab with a very nice head, this bridle is perfect and it is also smooth. Good price quality ratio. And indeed I do not like the rubber reins. Would have preferred beautiful dressage reins. Question: Are reins included in this bridle? 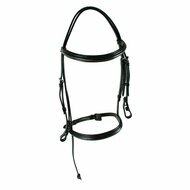 Answer: Rubber reins are included with this bridle.